Anyway, I had a LOT of emotions well up that I didn't expect. All the yucky feelings of the year before came flooding back, overwhelming my desire to write anything good. Since I couldn't figure out how to write anything positive, I didn't write at all. Really, my feelings were too big for a blog post. 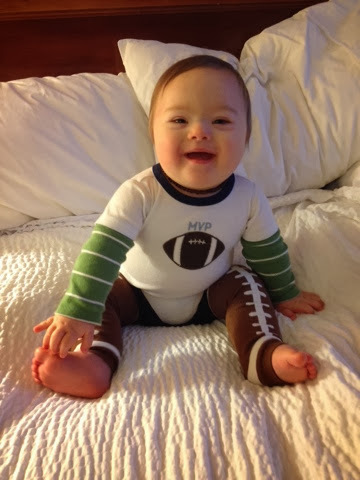 I love my Cade a million different ways, but if I could take away Down syndrome, I would. I accept that he has it, I accept that life will be harder for him, I accept that life will be harder for me. But if I could remove it, I would in a heartbeat. Down syndrome does not, WILL NOT, define him. I hope. I've been following the Robert Ethan Saylor story since it happened. If you're not familiar, you can read the whole story here. Ethan's story is the epitome of my fears for Cade. 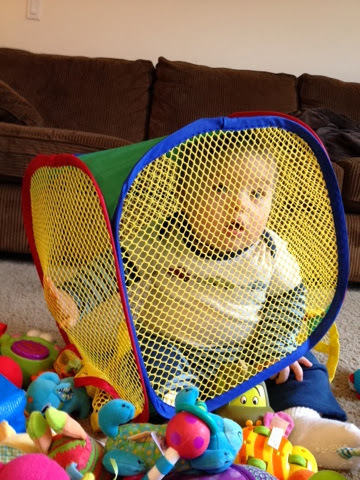 I recently saw a video montage of Ethan's life. He was adorable as a baby, chubby-cheeked and wide-eyed. Just like Cade. But as he aged, he gained weight and lost the cute baby look. By the time he died, at 26, he looked like the stereotypical person with Down syndrome: overweight, unkempt, and not all that attractive. His mother and sister clearly loved him, but I imagine lots of people avoided him. And it resulted in his early death. I don't want that for Cade!!!!! My only ray of hope is this: therapy is a lot different now than it was 26 years ago. Nowadays, kids with Down syndrome go to regular schools, sit in regular classes and learn alongside their typical peers. Kids with Down syndrome go to ballet, soccer, karate, and art classes. Our kids can learn to play the violin beautifully. Our kids can take award-winning photos. I even keep a list of people who have Down syndrome but also hold professional jobs. Pretty awesome, right? THAT'S what I want for Cade. I look at my baby boy this morning, playing with maracas, and I smile. 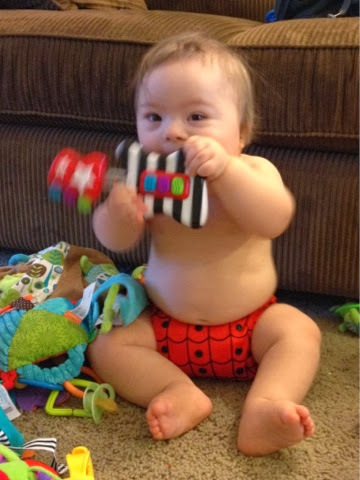 He's amazing, and awesome, and he's going to shatter stereotypes. And even if he doesn't, I'll love him just the same. But my mama heart hopes for more. If you read this far, then I'll reward you with a bunch more photos of Cade-O. Rock on, Dudes. God knew just the right family for Cade. 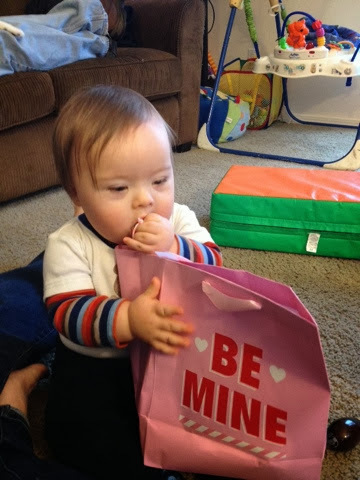 He had a boy with a beautiful smile and a lot of ground to break in the world of down syndrome and he needed a Mama like you to make sure it happened. You are an amazing woman, Heather, and I can't wait to see all the ways God is going to use you to shake things up! It's a bright future, a lot of hurdles, but a bright future no less! I appreciate your honesty! I want to encourage you about Cade's social life down the road. I grew up with three cousins with down syndrome (I still have two), one cousin with cerebral palsy, and one with social disabilities. And let me tell you, familiarity makes all the difference. We spent time together and all of the rest of us (50+) were able to learn how to be around someone with disabilities. They're not scary, different, or unrelatable. Another thing I noticed was the ownership the rest of us took. No one tolerated a harsh word against them and protected them from ridicule. I feel the same will be for Cade. Especially at church, he will grow up with the same kids and they will protect him and love him and include him. I look forward to seeing what awesome things he will accomplish in the future.